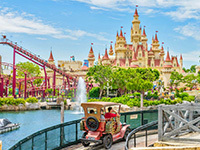 Tourism in Singapore is a major industry and contributor to the Singaporean economy, attracting 16.4 million international tourists in 2016, about 3 times of Singapores total population. It is also environmentally friendly, and maintains natural and heritage conservation programs. Along with this, it also has one of the worlds lowest crime rates. As English is the dominant one of its four official languages, it is generally easier for tourists to understand when speaking to the local population of the country, for example, when shopping. 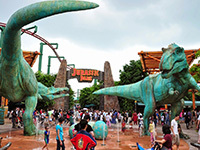 Transport in Singapore exhaustively covers most, if not all public venues in Singapore, which increases convenience for tourists. This includes the well-known Mass Rapid Transit (MRT) system. These are promotional rates and can be withdrawn at any time without prior notice. The rates are valid for minimum 02 adults traveling together at all times. Surcharges for single passengers opting for Single Occupancy room will be advised at the time of booking. The rates are not valid during exhibitions, conventions, special events and black out dates. Surcharges shall apply and shall be determined at the time of booking. We are not holding any Airline blocks for this package. Flights would be subject to availability at the time of booking. International Check in time is 1500 hours / Check out time is 1200 hours, early check in and check out is subject to availability and cannot be guaranteed. Seat in Coach airport transfers will operate from 0700hrs- 2200hrs. From 2300hrs- 0600hrs, private arrival/departure transfer shall be applicable with an additional supplement of SGD 22 per vehicle per way. From 0600hrs-0700hrs, Seat in Coach transfers are applicable with an additional supplement of SGD 5 per person. Sightseeing tours are strictly based on weather conditions and local service providers have the right to cancel the sightseeing tours without prior notice. As a practice all international hotels take a security deposit at the time of check-in. The amount is generally blocked on the clients credit card or they can pay cash to the hotel. The amount will vary according to the hotel and is refunded back to the clients upon check out. Debit cards should not be offered as it will be charged immediately and refunded only after 2-3 weeks. Ezeetrip.com is not responsible for any change in the price due to factors not in the control of the organization. Ezeetrip.com shall not be responsible for any loss, damage, accident, changes in schedule arising from factors within or beyond our control. For travel to Singapore, travelers must have a passport valid for six months from the date of return and he/she must obtain a valid Singapore visa prior to their date of departure. Singapore visa usually takes 4-5 working days to process provided all required documents are submitted. The grant of Singapore visa is subject to Singapore immigrations approval. We will not be responsible for any delays or disapproval of visa. If circumstances force you to cancel the Booking, the cancellation must be intimated to us in writing and the following cancellation charges will apply. Same cancellation policy will apply for postponements of bookings or in case of change of hotels during the progress of tour. Cancellation charges may vary during festive/ peak / trade fares / F1 / Songkran / Chinese new year/ Christmas / new year / Diwali / Eid period. The above policy would not be applicable for iconic hotels such as Marina Bay Sands, Burj Al Arab, Atlantis, Venetian, Genting etc. Upon Arrival at Singapore Changi Airport, meet our local representative, who will assist your transfer to the hotel. On reaching the hotel, complete all the check-in formalities and take rest in your room or Explore the city on your own. After a hearty breakfast, Proceed for the Half day City Tour including The Merlion Photoshop, Fountain of Wealth, Suntec City, Orchard Road, Little India and China town. Later in the evening , proceed to Night Safari. Experience close and personal encounters with with over 2,500 nocturnal animals from 130 species on Hop on board the tram for a 40 minutes. Journey from the Himalayan foothills to wild Equitorial Africa, this tram ride offers live commentary. Later, a Night Show of 20 minute animal presentation will introduce you to nocturnal animals. Return back to hotel. Overnight in Singapore. Breakfast at hotel. Morning at leisure. 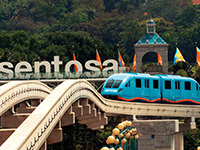 Afternoon enjoy your day at Sentosa Island. Enter and explore the marine realm of S.E.A. 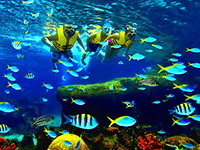 Aquarium, home to more than 100,000 marine animals of over 800 species, across into 49 different habitats, each one as fascinating as the next. Its an experience you wont forget. Surrounded with lush tropical greenery, Butterfly Park and Insect Kingdom showcases the stunning beauties of mother nature. With a great variety of fluttering butterflies and exotic insects, this tamed wilderness is sure to delight you. The Luge offers a truly unique outdoor experience suitable for all ages that is not found anywhere else in Singapore or Southeast Asia. After Luge, board the Skyride and take in the fantastic panoramic scenery of the city skyline and beautiful coastline. There is no better way to complete a fabulous day at Sentosa than to take in a spectacular night show set outdoors against the backdrop of an open sea. Come, discover an awe-inspiring display of water, laser and fire effects, set to majestic music and a panorama of breathtaking vistas - Wings of Time. Weaved together by a tale of friendship and courage that will linger with you long after you leave the magical isle. Return back to hotel. Overnight in Singapore. Breakfast at hotel. Today the day is free for you to explore this city on your own. Overnight in Singapore. Morning enjoy your breakfast at hotel, check-out from the hotel. Then, transfer to Singapore Changi Airport to board your return flight home.